Next up in the series is Magic Johnson. The man who redefined the point guard position. In only 13 seasons of work Magic Johnson became one of the greatest to ever do it. Magic wasn't the highest scoring player but made up for that with steals and assists. Magic made the finals in 9 of his 13 seasons with 5 NBA Championships. Johnson born in Lansing, Michigan stayed near home and went to Michigan State for his college career. While in college he won the National Championship, in that game he faced is rival Larry Bird of Indiana State. 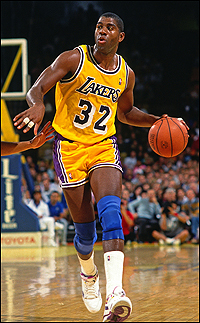 Magic was drafted first overall by the Lakers in 1979. He joined forces with Kareem Abdul-Jabbar and won the NBA title and NBA finals MVP in his rookie year. Magic won all of his championships with Kareem playing along side of him. The major case against him is that he had another top 10 guy playing along side of him. Kareem makes a strong case for the greatest of all time and both are possibly top 5 of all time. The stats don't add up to some of the other superstars because of the early retirement due to HIV, but the numbers over a 13 year stretch and the NBA titles are worthy of his inclusion in the greatest of all time conversation.